‘A poem is a walk,’ A R Ammons once claimed. With that in mind, the Scottish Poetry Library, Royal Botanic Garden Edinburgh (RBGE) and Cove Park launched Walking With Poets, a new project for 2013, the Year of Natural Scotland. Armed with iPads, four poets used new media to explore the RBGE and its regional gardens, uploading their work on a regular basis to walkingwithpoets.com. 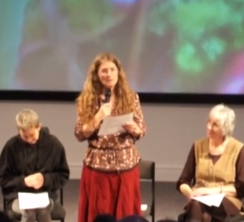 Here, we speak to the Scottish Poetry Library’s Frances Hendron at the closing party for the project, where all four poets came together to share their experiences.